I just got a 2004 Yamaha that needs some work.Its got wet brakes on the front that Im trying to get working.My problem is the brake lever.This the lever on it now.On the master cylinder it has a cable in it that has the wire that fits in a slot inside the lever itself but this lever isn't made for that.I dont know if whoever had it before didn't know what they were doing or what but its the wrong lever for this machine. Can someone point me in the right direction here? I looked at the Yamaha website and the schematics only show a part that looks like this one here. 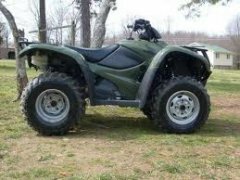 Again,I have a 2004 Yam 400 Kodiak 4x4 and its an automatic model. BTW,the master cyl. was bone dry. I was gonna change out the rear brake shoes and when I went to pull off the wheel,get this, each wheel stud had 2 different sized washers holding the lug nuts to the wheel rim. The stud holes were so worn out it had worn away the base of the studs and the holes were the size of quarter! Im lucky someone didn't die while riding this! A word to the wise.Pay attention to what you buy.Look carefully and keep a keen eye out. This was my fault because it was the 1st ATV Id ever bought and I didnt notice alot on this machine so I guess I count myself lucky in that I didnt get hurt nor did anyone else who rode it either. Hi, (Big Bear 350 4x4 1990 +- year, I am still looking for the VIN). Quad starts and runs and has 2 cables coming out of the throttle cable assembly one goes to the carb the other is not connected. Where should the unconnected cable be connected to ??? I have a service manual but can only find talk of "Throttle valve cable" and "Piston valve cable" I cannot see where the "piston valve cable connects. Any help especially with pictures would be good. Got another question....lol.... im pretty good at asking and always want to try and help answer some if I can.... my question is - my choke/starter cable doesnt seem to me seating all the way when in the non choked position. I can see some rust up around the lever on the cable part itself and was wondering if there is a way you can lube these or would it be best to just replace it with a new. Any info is highly appreciated.